Mc Gowan has a long-standing reputation constructing interiors for a range of clients, many with demanding finish details and complex mechanical systems. The firm is active in conversions, renovations and new construction of mixed-use, residential and hospitality projects in the logistically-challenging NYC marketplace. An ultra-modern 14-story luxury residential complex in Cliffside Park, NJ completed in late 2018. A High Line luxury residential development with an 11-story tower containing twelve condominium units. Interior fit-out of new 120,000 sq ft offices at iconic Empire Stores building in DUMBO, Brooklyn. 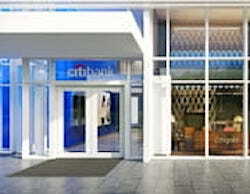 A LEED Gold full-service facility housing a Citigold luxury suite on the ground floor of the Miami Center. An extensive modernization of luxury downtown Manhattan residences overlooking the Hudson River. A luxury residential highrise amenities upgrade in lower Manhattan that includes a social lounge, kids’ room and fitness center. The third mixed-use residential building in the Myrtle Avenue, Brooklyn development plans. A private 75,000 square foot, K-12th grade, all-female university-prep school on Manhattan’s Upper East Side. With a 429-person-capacity sanctuary, it’s the largest NYC synagogue to be built in over 50 years. The retail fit-out of an immersive-experience photography boutique on Fifth Avenue in NYC. Turning a Greek-revival townhouse into a modern mixed-use masterpiece while abiding by The High Line zoning restrictions. This new community center and synagogue on the Upper East Side is set to be 14 stories and 65,000 sq ft.
First generation office space for a high-end financial services firm in Miami with an interior build-out meeting LEED Gold Standards. A new Turner-Agassi Charter School facility in Bronx, NY currently in the pre-construction phase. Our most important priority is achieving our client’s project goals. As a family-owned company, Mc Gowan’s reputation is built on accountability, trust and providing quality construction services. Taking ownership in each project, clients are supplied clear project reporting, fostering unity and collaboration within the entire project team. The firm strives to partner with its clients, proudly delivering work that endures the scrutiny of close inspection.